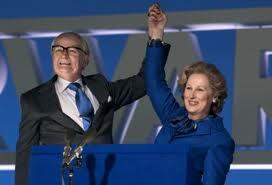 When Hollywood hands out its little gold statuettes tomorrow night, we’ll find out how The Academy voted on the nomination of Meryl Streep and her empathetic performance in the role of Margaret Thatcher as a politician and a wife. The story is primarily about a British woman attaining so much power in the 1980’s that she became Britian’s first woman prime minister. But the movie is also a love story and a reminder that no matter how high the government position you are elected to, no matter how much money you make, no matter how much privilege surrounds you, human beings are all the same when it comes to losing a loved one. The same pain, confusion, and shock from a loss hits a Prime Minister as hard as it hits a painter. Grief is a great equalizer. Even Margaret Thatcher, the former Prime Minister of England and subject of the Oscar-nominated film, “The Iron Lady,” searches for meaning in the midst of her grief. Surprisingly, “The Iron Lady,” shows us an elderly Margaret Thatcher preparing to eat breakfast with her husband, Denis. She is talking to him about the usual things husbands and wives talk about in the morning. The camera shows Margaret Thatcher talking about the price of milk as she starts to eat her soft boiled egg and then the camera shows Denis on the other side of the table folding his newspaper, conversing with his wife. We think it’s a routine scene about a husband and wife having breakfast but then Thatcher’s assistant enters the kitchen and we see that Margaret Thatcher is sitting at the table alone and she has been talking out loud to herself. There is a place set on the other side of the table where Denis would be sitting were he alive. But for Margaret, Denis is still very much alive in her imagination and she “sees” him as she has every day of her married life. That is when we bond with her as a human being, when the person of Margaret Thatcher is revealed. We feel the same jumble of emotions that anyone would feel were we in her position of adjusting to life without her loved one. Her husband may be gone but she still talks to him because she feels his presence and it doesn’t seem strange to her to talk to him even though he is no longer physically present. Lots of people do this and it’s perfectly normal. “There should be no stigma…It’s about life. It’s about the truth,” Meryl Streep said in a television interview discussing the personal scenes where she depicts Thatcher as an 86-year-old widow. Then there is that moment in the movie when Margaret is being urged by others to get rid of Denis’ clothes and his other belongings. We expect that Margaret Thatcher, who appears to be ice cold and steely strong in her public life, will also handle the death of her beloved husband in the same stoic manner. But we would be so wrong.